The Self-Portrait Machine is an art project created by Jen Hui Liao. It starts by taking a picture of the individual user. Then the wrists of the user are securely fastened to the robotic arms of the machine, and a pen is placed in the hands of the user. 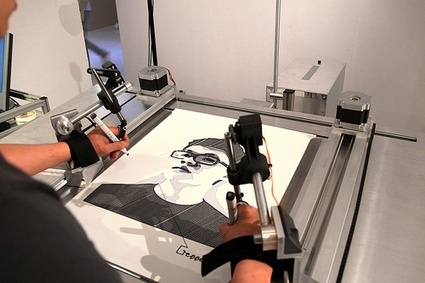 The Self-Portrait Machine then moves the user's wrists, forcing him or her to create a self-portrait based on the photograph taken. This project reminds me of the different ways that sf writers have imagined the relationship between human beings and machines. Will we build machines that force us to create something terrible? Or will machines supervise us as we mature and create beautiful art? From we make money not art via Gizmodo.